You do not need any drivers to plug your ARCHOS to your computer. ARCHOS products have been designed to be automatically recognized by recent operating systems. • If you connect your ARCHOS to your PC and it has Windows Media Player 10 or higher installed, it will connect (default connection mode) as a ‘Media Device’ and allow purchased music and videos to be synchronized to your ARCHOS. • If you connect your device to your PC and you have an older Windows Media Player version on your computer (Media Player 9 or lower), the unit will automatically switch to Hard Drive Mode. Only protected music and videos from your PC cannot be synchronized to your ARCHOS in this mode. Protected music and videos from your PC cannot be synchronized to your ARCHOS in this mode. Note 2: If you receive a message saying that your unit is not compatible, you can proceed and click on "Continue". 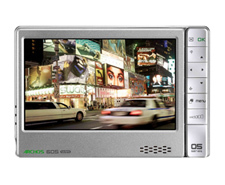 ARCHOS products are fully compatible with the recent Windows and Macintosh operating systems. I have installed a firmware/plug-in/game file on my ARCHOS but it is not recognized by the device. You may have copied the firmware/plug-in/game file (type ".aos") into a folder on the device and not to the root level. If it has been copied in any of the folders of the ARCHOS, it won’t be recognized automatically and will not ask you to complete the installation process. To locate the ".aos" firmware/plug-in/game file, use the ARCHOS file browser from the Home screen, and then tap on the file. If you have not seen a progression bar showing the installation, then the firmware/plug-in/game file has not been installed. It is possible that during the install process, you accidentally tapped on the screen and exited the install process. Tap on the ".aos" file again (using the ARCHOS file browser) and make sure that you see the progression bar indicating that the file is being installed. Note: If you have a WiFi connection, you can also update your firmware online (MENU > Settings > System > Software and Plug-ins). I have downloaded a plug-in/game file but I cannot install it. The file size is 0 Kb or a message says that it is corrupted or that the update has failed. - Download your file a second time as your download may have not been successful. - Check that you have entered the correct 'Product Key' (Menu > Settings > Firmware and Plug-ins). If there is a "0", make sure you entered the figure "0" and not the letter "O". If you still cannot install your file, you should contact our Technical Support. My ARCHOS displays “Error Code 207.” What should I do? This error occurs when one attempts to install an incompatible firmware. For example, a firmware for the ARCHOS 5 was being installed on an ARCHOS 605. Go to your customer account (or create one if you don’t have one yet) where you can find the latest update software (firmware) for your particular ARCHOS product (Manage Products > Support > Firmware). My ARCHOS cannot play Flash games. Your games may not be supported by your device as they have been designed to be played on a computer. Certain features of the Flash game may not work on a computer or may react less rapidly. 1. Copy the ".swf" file (the Flash game) into the folder named “Flash” on the ARCHOS. 2. Manually update your ARCLibrary. To be able to update it, switch the USB mode to PC Hard Drive mode (MENU > Settings > System > USB mode) so that the “Update the ARCLibrary” button can be activated. Now you should be able to access your games through the Widgets icon. Can I connect my ARCHOS to my computer using a USB hub? Yes, you can connect your device using a USB hub. However we do not recommend it since not all USB hubs (powered or unpowered) do not deliver enough power to enable a good and reliable USB connection. If connecting your cable through a USB hub does not work, plug it into a USB port directly on the computer. On older computers, the front USB ports may not be sufficient, try the back of the computer. How do I update the ARCHOS software (firmware)? • Directly on your ARCHOS if you can connect to a WiFi network. Go to MENU > Settings > Firmware & Plug-ins and select "Online Firmware Update". Your ARCHOS will connect to the Internet and start downloading the latest firmware to the device. This may take some time as the update file can be rather large. Once downloaded to your ARCHOS, it will ask you to install it. If you do not see the progression bar on the screen saying “Installing”, then the update hasn't been installed yet. Before you download the firmware file, check to make sure you aren't already running the latest version of the ARCHOS software. Compare the latest on-line version (example version 1.0.8) with the one installed on your ARCHOS (Menu > Settings > Firmware and Plug-ins), example 1.0.51. In this case, since the version on the ARCHOS Web site is higher, you should download and install it. Download the latest firmware by going to your customer account. Click on "Manage Products", and then click on "Support". Go at the bottom of the page to find the latest firmware. Connect your ARCHOS to your computer and copy the software (file type ".aos") to your ARCHOS. Disconnect the ARCHOS and then, if it doesn't automatically ask you to install the new software you just copied to it, use the file browser from the home screen to locate the update file and tap on it. Why is it impossible to copy files larger than 2 GB to my ARCHOS? You cannot copy files larger than 2 GB in the default USB mode to your ARCHOS due to the FAT 32 and Media Transfer Protocol (MTP) constraints. However, changing your USB connection type setting on your ARCHOS will enable you to transfer files up to 4 GB (except for “.avi” files). For this, go to Menu > Settings > System. Next to "USB Preference", switch from "Windows Media Device" (default USB connection) to "PC Hard Drive". ATTENTION: When your ARCHOS is in 'PC Hard Drive' mode, safely remove the device before disconnecting it from your computer. On your computer, click on the "safely remove" green arrow icon in the Windows system tray (see the illustration in the full manual). Can I drag and drop files from my PC directly to my ARCHOS? Yes. Simply open 'My Computer' and double click on the ARCHOS icon and then open the folder inside that you'd like to copy your file(s) to. Then just drag the file(s) from another window into this folder. If your computer does not allow you to do this, you can set your ARCHOS to be seen by your computer as just another Hard Drive, thus making any drag and drop possible. Tap on Menu > Settings > System. Next to "USB preference", switch from "Windows Media Device" (default USB connection) to "PC Hard Drive". In this mode however, purchased music and video (copy-protected files) on your computer will not be transferable to your ARCHOS. ATTENTION: When your ARCHOS is in 'PC Hard Drive' mode, safely remove the device before disconnecting it from your computer. On your computer, click on the "safely remove" green arrow icon in the Windows system tray (see the illustration in the full manual). What is the storage capacity of the ARCHOS 605 and 705? - 4 GB: 5 movies, 40,000 photos, or 2,000 songs. - 30 GB: 40 movies, 300,000 photos, or 15,000 songs. - 80 GB: 100 movies, 800,000 photos, or 45,000 songs. - 160 GB: 200 movies, 1,600,000 photos, or 95,000 songs. - 80 GB : 100 movies, 800,000 photos or 45,000 songs. - 160 GB : 200 movies, 1,600,000 photos or 95,000 songs. Note: The amount of images, videos, and songs you can store on your device will vary depending on the size, bitrate, resolution and the encoding quality of your files. I can’t type any numbers on the virtual keyboard. Where are they? You have to first press the green “Alt” button to access the numbers. A widget is a piece of software that extends the features of the ARCHOS. It provides you a fun, quick and easy access to hundreds of utilities such as local weather forecast, sports results, and even games...right on the device. I did not get any supplied software or manual with the ARCHOS. Where can I find them? Windows Media Player 11 is the recommended software used to synchronize your video, music, and photo collection to your ARCHOS. If you are a Macintosh or Linux user, you cannot synchronize your music, videos, and photos with Windows Media Player. Just copy and paste your media files into the corresponding folder on the ARCHOS once it is connected. • Directly from your ARCHOS: tap on Menu > Info and then tap on the PDF file to open it. • From our Website to find the latest version of the full user manual. What is the use of the GPS demo mode called “Switch to Demo Software GPS”? The demo mode included in the device is designed to be used at retailers only. Do not use it as it merely searches for two short video demonstrations to play in a loop for store displays. Your device does not have the video demonstration files. Thus this function will not work for you. If you need information about how the GPS operates, click here to find a detailed description on our Web site. Can the ARCHOS view text or PDF files? The ARCHOS can read PDF files. Advanced features in PDF files such as password protection may not be recognized though. For ".txt" files, if you have purchased the "Web Browser" plug-in, the ARCHOS will launch the Opera browser and display the file when you tap on it in the file browser. It is playing music, photos or videos from another computer on the Internet directly on your local WiFi network on your ARCHOS without having to copy the file to the device. After connecting my ARCHOS to my computer, I can see files such as “desktop.ini”, “._image.jpeg”, “finder.def”,”._file”, “System Volume Information”, “DevLogo.fil”, etc. These files have been created by the ARCHOS device itself. Windows and Macintosh Operating Systems often write extra files to your device’s hard disk such as these types of files. This is normal and these files will not damage the device. Advice: If you have a Macintosh computer,you can delete "._ files" if you prefer. How can I lock/unlock the buttons on my ARCHOS ? Press and hold the “TV/LCD” button to lock or unlock your device’s buttons/touchscreen. I have an ARCHOS 605 and I would like to benefit from the new GPS function. Do I have to buy the 605 GPS or can I just add the GPS function on my current device ? You do not need to buy the ARCHOS 605 GPS. The GPS function can be implemented on your current 605 device by purchasing the GPS Car Holder Accessory on our Website. This accessory contains the actual GPS receiver and includes the maps on a DVD. Can I change the hard drive capacity of the ARCHOS? No, the capacity of the hard drive cannot be changed. There is not an HD upgrade service through the ARCHOS repair center. ATTENTION: Opening your ARCHOS voids the guaranty and changing the hard drive will render your device unusable as the original hard drive is coded to a particular device. When I turn my device on, I am asked to type my parental code. What is the code? The default parental code is “0000”. If it is not accepted, that means you have changed the code by creating a personalized passcode. If you do not rembember it, contact our Technical Support and give your 'Product Key' (number of the device). The 'Product key' is found under MENU > Settings > Software and Plug-ins. I forgot what the 'Parental Code' is. Where can I get it? The factory default code is "0000". If you have changed it and forgotten it, then you'll have to contact our Technical Support and give your 'Product key' (number of the device). I cannot see files that I copied to my ARCHOS from my computer. You may have copied files whose format is not supported by the ARCHOS such as Office documents (ex: ".doc", ".xls", ".ppt"), or audio (Real Audio, Ogg Vorbis, etc.). The ARCHOS will not show the files using the Video, Music or Photo browsers that it cannot play. To see all your files, use the File browsing tool. How can I activate the parental code? From the home screen, go to MENU > Settings > Parental Control. The default parental code is "0000". 1. Select “Change the code”. 2. Choose a 4 digit code through the virtual keyboard. Write it down and keep it in a safe place so you do not forget it. 3. Confirm and validate your new code by selecting “Apply”. 4. Switch from “Parental mode” to “Child” mode. Adult marked content is no longer accessible and the parental control parameters cannot be modified without this code. Can I play (stream) my PC's media files directly on my ARCHOS without having to copy them over to it? Yes, this is the beauty of WiFi and UpnP (Universal Plug and Play). You can watch videos, music or photos that are stored on your computer directly on your device through a WiFi connection. You just need your computer to have a WiFi connection and have Windows Media Player 11 or higher installed on your PC. Then, configure Windows Media Player (see Windows Media Player's sharing options in our full manual). 1. Connect your ARCHOS to your home's WiFi network (see Connecting to a WiFi network in the full manual). 2. Open Windows Media Player 11 or higher. Click on Library and then on Media Sharing. Your ARCHOS device will appear in the Window of devices to share to. Be patient, it may take up to 10 minutes the very first time to recognize your ARCHOS. Make sure your ARCHOS is on and connected to the same WiFi network as your computer. 4. On your ARCHOS, enter the Video, Music or Photo menus. Then tap on the first item in the list "Network 'UPnP' to access your media files. How can I make my ARCHOS become compatible with MPEG-2, H.264 and AAC formats? You need to purchase optional software plug-ins and install them on your device. These plug-ins are available here on our Website. - Video Podcast plug-in to play H.264 video files, as well as non protected ACC audio files. I would like to transfer my DVD’s on my ARCHOS through Windows Media Player but I can’t. Windows Media Player will not convert a DVD for you. Some DVD’s are copy-protected and you cannot make copies or transfer them onto your ARCHOS, either through Windows Media Player or by cutting and pasting in Windows Explorer. - Purchase the Cinema plug-in (available here on our Web site). This plug-in will read MPEG2 file types, the same file type that is inside of the ".vob" files on the DVD.Then, it is just a matter of copying the VOB files found on your DVD and pasting them into the Video folder of your ARCHOS. - Convert the DVD to a format readable by the ARCHOS (WMV9 or MPEG-4) with a third party software which can rip DVDs. Check out the website www.mpegmobile.com which lists a few of the available third party that can do video conversions and/or DVD ripping. The converting of a commercial DVD’s to an electronic, transportable format such as MPEG or AVI is known as DVD Ripping. You must ensure that you are authorized to copy before doing such or before copying the VOB files to your ARCHOS. Check your local legislation. ARCHOS does not condone nor support the copying of copyrighted materials, or of the defeating of any copy protection schemes, such as used in some commercial DVD's. I cannot play files (WMV, WMA and MPEG-4) even though these formats are supposed to be supported by the ARCHOS. • The file you are trying to play may be corrupted. Try playing it on another ARCHOS device or a computer to see if it plays. If you have changed the extension of a file, for example by renaming it from basketball.vob to basketball.avi, this does not change its format and it still will not play. • Some WMV or WMA files are purposely copy-protected so that you cannot play them. • If video resolution is too high, it may not be able to play. The ARCHOS plays video files up to 720x586 in dimension. • If the video file is WMV, it may not necessarily be WMV9. - WMA audio files that are of type ‘Pro’ or ‘Lossless’. • It may be that the file uses a codec that is not recognized by the ARCHOS, even though the container type, ".wmv", ".avi", is used. Can the ARCHOS read subtitles and which ones are compatible? Yes, the ARCHOS can read subtitled files but only those having the following extensions: “.srt”, “.ssa”, “.sub” and “.smi”. Make sure your subtitled files are in the same folder as your video files and have exactly the same name (ex: “video_1.avi” and “video_1.srt”). Which video formats are supported by the ARCHOS? These plug-ins are available here on our Web site. I have downloaded the Cinema plug-in but when I try and drag and drop a VOB file to my video folder on the device it still gives the error message that this type of file is not supported. - Verify that the Cinema plug-in really did get installed. It will show up in Menu > Settings > Firmware and Plug-ins. - When copying a VOB file to your ARCHOS, and your device is in ‘Windows Media Device’ mode (see in Menu > Settings > System > USB Preference), make sure that you paste the copied file into the folder "Video". Do not try to synchronize a VOB file with Windows Media Player. - You can also try changing the USB Preference and switch from "Windows Media Device" to "PC Hard Drive" and copy it over using Windows Explorer. If you still cannot copy your VOB files, it could be that the DVD has a copy protection system that will not allow VOB files to be copied correctly. Try copying files one at a time, sometimes this can make a difference. When I play a video, it does not play correctly. Either it stops in midplay, skips or the sound and image of the video are not synchronized. Go into Menu > Settings > Power and select "Device Complete Power off".The ARCHOS will automatically shut down. Turn on your device as usual and play it again. If the condition continues, play it on your computer and compare the results. How can I increase the battery life of my ARCHOS? • Shut down your device completely when you do not plan on using your device for a while (keep the button held down until you see the shutting down message). • Change the settings on the ARCHOS (see Power Settings in the full manual). Tap on Tools > Settings > Power. Then set the parameters to lower values so that your device will consume less power. • Set the screen brightness to a lower level (Menu > Settings > Display > LCD Backlight). • Purchase the Battery Dock (additional accessory). For more info, go to our accessories page of our Website. How long can the battery last on a full charge? - 5 hours when you play videos. Then, the battery life also depends on the size and the encoding quality of your files. Can I replace the battery on my ARCHOS 605? If you want to increase your battery life, you can purchase the Battery Dock (available here on our Web site). The battery of my ARCHOS will not hold a charge as long as it should. - 5 hours (for videos) and 25 hours (for audio) for the ARCHOS 705. 1. Make sure you have the latest firmware on your device (see Updating the firmware in our full manual). 2. Charge your battery fully. You must wait until the green “CHG” light starts blinking to be sure it is fully charged. This can take up to 6 hours using the USB cable or more if you use the product during the recharge. Note 1: Video files in very high quality (for example MPEG 2 files) will access the hard drive more often and deplete the battery faster than videos of lower quality. Note 2: Using the additional accessories (DVR Travel Adapter, Battery Dock and Mini Dock) will allow you to charge your device quicker. For more information, refer to our accessories page. If you are still having problems with your battery, please contact our Technical Support to determine and correct any batteries issues. When the battery is completely discharged, how long do I need to charge it? It can take up to 6 hours using the supplied USB cable to fully charge your device. Note: Charging time will increase if you use the product during the recharge. If it takes significantly more than 6 hours to charge your battery, it may be damaged. Using the additional accessories (DVR Travel Adapter, Battery Dock and Mini Dock) allows you to charge your device quicker. The battery seems to be fully charged since the battery icon shows ‘full’ but the "CHG" indicator LED does not blink. If your indicator LED is not blinking, it means that your battery is not fully charged. You must wait until the green "CHG" light blinks to be sure the battery is fully charged. The battery icon does not indicate the level of charge while it is charging. The flashing lightning just indicates it is charging. Which music file formats are supported? These plug-ins are downloadable here from our Website. When I synchronize music files through Windows Media Player, the tracks are not displayed into the Music Library categories (artists, titles…) but only in the internal memory. Your music files may not be tagged, which means they do not contain any data about artists, titles or song names. As a result, the files cannot be classified in the Music library categories. 1. Go to Menu > Settings > System > and change the USB mode "Windows Media Device" to "Hard Drive". 2. Select “Update the ARCLibrary” (as the button is now enabled). This will recreate your Music (and Photo) library. When I synchronize music files from Windows Media Player, error messages are displayed. • Some file types (example ".ogg") will not be converted for playback with Windows Media Player. You will need to find a third party software to convert them to a suitable format such as ".avi" or ".wmv" for videos or ".wav" or ".mp3" for audio. • If the license date of a protected file is expired, you could also get an error message. Once a license expires, you cannot do anything with it. • You can also get an error if the file you are trying to synchronize was on a network that is no longer connected or on an external hard drive that is no longer connected to the computer. How can I create a playlist directly on my ARCHOS? 1. From the home screen, go into the Music browser. 2. Do not choose "Playlist" (this is the list of all the playlists you have already made) but just select MENU > Show Playlist. A playlist panel will automatically open on the right where you can start adding songs to create your new playlist. 3. In the left panel, locate the song you want to add to your playlist by selecting one of the Music Library items. Select the desired track twice. It will be inserted in the right panel and added to your new playlist. 4. Repeat this operation for each track you want to add to your playlist. 5. When you have finished creating your new playlist, switch to the right panel (press the tab button or tap on that side of the screen). Select MENU and choose "Save as" to give a name to your playlist. Can I create a playlist and transfer it from Windows Media player to my ARCHOS? Yes, you can create a playlist and transfer it directly to your ARCHOS if you use Windows Media Player 10 or higher. Refer to Windows Media Player Help on how to create a playlist. 1. Make sure you have the most recent firmware running on your device (see Updating the firmware) in our full manual). 2. Make sure your ARCHOS is in 'Windows Media Device' mode (default mode). To check this, go to Menu > System > USB preference and make sure "Windows Media Device" is selected. 3. Connect your ARCHOS to your computer and select "Enable USB". You should see "Windows Media Device" displayed in the Windows Explorer screen. Note: If your device automatically switches to 'Hard Drive', this means that your Windows Media Player doesn’t recognize your ARCHOS as a Windows Media Device as you don’t have the required version (Windows Media Player 10 or higher). 4. Select the "Sync" tab, choose your Playlist to synchronize and click on "Start Sync". When your synchronization is over, disconnect your ARCHOS device. 5. To view and play your playlist, open the Music icon from the home screen of your ARCHOS. Go into the Music Library and select "Playlist". How can I schedule TV recordings? There are two ways to schedule recordings. - or with ARCHOSlink software if you don't have a WiFi connection. 2. Select the TV show you want to record on the TV Program Guide. 3. Place the ARCHOS onto the DVR Station. It will turn your TV box tuner on and record your TV show at the appropriate time. 1. Select the TV recorder on the home menu screen. 2. Manually enter the recording time. I cannot download and synchronize the TV Program Guide through ArchosLink. • Make sure that your Internet connection works and that your ARCHOS is detected by your computer. You will see the name of your device in the lower right corner of the ArchosLink window. • Make sure you are running the latest version of the ArchosLink software. • The message “Synchronization finished” in the bottom right only means that no current podcasts are currently being transferred to your device. • The “Podcast” for your TV Program guide is called “Update TV Program Guide”. This is a special podcast and you will not see a URL associated with it. • If you get an error after the TV program guide downloads (but before it syncs to your device), restart your computer and then reconnect your ARCHOS. Make sure it shows as “connected” in the bottom right of the screen. In ArchosLink, click on “Update TV Program Guide” and then on the button “download”. I bought my DVR Station outside of Europe and I cannot install it with the supplied cables. The connection cables delivered are different for the North American and European products. You do not have the scart connector required to set up the DVR Station in Europe as it is only supplied in European packages. If you want to use the DVR Station in Europe, you will need to purchase a scart adapter to use with the North American cables supplied. ARCHOS does not make for sale separately the special scart cables supplied in the European packages. I cannot register my DVR Station on my customer account. Since the DVR Station is an accessory, it is not registered as a stand alone product. Go to your account page and click on "Manage Products". Select your ARCHOS device. Next to "TV Program Guide", you will find a link on the right labeled “More …”. Click on this link and then click on “Subscribe to the TV Program Guide”. When I select the “Recorder” icon, it says “Activate the TV Program Guide online” although I have already registered my device online. Plug your device into your powered DVR Station and then remove it after 20 seconds. This will ‘reminds’ the ARCHOS that you have a DVR station and can make video recordings. I tried to set my Infrared Emitter but I could not find my tuner brand in the available list. How can I get the DVR Station to control my cable box, satellite receiver, etc.? 1. Make sure you are running the latest version of the firmware. As there are constantly new video products being added to the market, there may be some devices that are not listed. 2.Try using all of the codes for a particular brand, there are typically more than three or four for any given brand (ex: When setting the code, 2/4 means that your trying code group 2 of 4 available code groups). If your brand is not listed, then try to find out if that brand is actually manufactured by another company whose brand is on the list. The codes for that brand would then be compatible with your device. When I plug my DVR Travel Adapter to my ARCHOS, a message says, "Wrong module type." What do I do? Remove the module, shut off the ARCHOS, clip the module back onto the ARCHOS and then restart the ARCHOS. If you still get the message then the module most likely needs to be replaced. Contact our technical support to start the process to get it replaced under your guaranty. You may be requested to send back your ARCHOS as well as this may be the source of the problem. I have downloaded and synchronized the TV guide to my ARCHOS but when I select the “Recorder” icon, the screen shows “No TV Program Guide information available”. First make sure you that your clock and date are correctly set. 1. Make sure that you have Windows Media Player 10 or higher on your computer. 2. Set your device to Hard Drive mode (Menu > Settings > System > USB mode). 3. Connect your ARCHOS to your PC and open up the folder “System” of the device. 4. Delete the file “epglist.dat” in the folder “EPG”. 5. Reconnect to your PC and run ArchosLink. Select the “Update TV Program Guide” and click on the button “Download”. Can I record a TV show and watch another channel in the same time? Only if the TV box has 2 tuners or if you have 2 video sources. Can I view my photos while listening to music? Yes. You just have to select your music first. You can then display a slideshow or browse through your photos (zoom, selection...) without any impact on the music playback. Which image formats are supported by the ARCHOS? Note: Certain resolutions and file sizes may not be compatible. Why can’t I view some of my pictures? The format of the photos that you save or synchronize to the ARCHOS must be JPEG, BMP and PNG. Other file formats such as RAW are not supported. Check the resolution and the size of the files. I can’t see the shared media files on my PC after having enabled sharing with Windows Media Player 11. • Make sure you have a good WiFi connection and that your ARCHOS and your PC are connected to the same WiFi network. See Connecting to a WiFi network in the full manual. • Check that you have properly set up the sharing options in Windows Media Player. See Setting Windows Media Player's Sharing Options in the full manual. You should see an icon of your ARCHOS in the 'Sharing parameters' window. Note: the first time you set your sharing options, it might take a few minutes for your PC to display the ARCHOS icon. • Check that any Firewall software you have installed is not blocking your PC from sharing multimedia content from Windows Media Player. I cannot connect to my WiFi network. • If you got one of these 2 messages ("No configured network found" or "Could not connect to any WiFi network! "), select "View available networks". Typically home networks are encrypted. Check your WiFi access point documentation to find out what type of encryption it has by default (WEP, WPA, etc.) and what the encryption key/password is that you must enter. • Your network is protected: a closed padlock icon next to it when the ARCHOS shows the available WiFi points. The network require passwords or passphrases. • The modem/router allows only specific WiFi devices to connect to the network (known as MAC address* filtering). You should ask the person that has configured the WiFi access point if such filtering has been put in place. If it is the case, you need to give the MAC address of your ARCHOS. To find it, go to Menu > Settings > System. *A MAC (Media Access Control) address is a unique, hardware-based identifier that specifies your particular WiFi device. When I try to connect my ARCHOS and my computer on the same network, my connection is cut due to an IP address conflict. Your PC and your ARCHOS are most likely configured exactly the same way. They are trying to use the same Internet Protocol address. Thus there is a conflict. When you configure the network connection on your ARCHOS, select “Automatic (DHCP)" and simply tap on "Connect". Make sure your router is DHCP enabled as well. If you want to keep fixed IP numbers, then use another IP number for your ARCHOS. Example: If both your computer and your ARCHOS use 192.168.1.1, then set your ARCHOS device to use 192.168.1.2. Your WiFi router and/or modem must allow such addresses to be used. That is why it is best to check the box in your router’s configuration to enable DHCP on the router and/or modem. I have the Cinema and Video Podcast plug-ins but I cannot play VOB and H.264 files on my unit through media sharing (UPnP) with Windows Media Player 11. Windows Media Player 11 used for UPnP does not support VOB files. With H.264, resolutions of 720x576 or higher are not supported. I can’t connect to my WiFi network through my Orange Livebox. Press the “pairing” button on the back of the Orange box before you try to connect with your ARCHOS. This will allow the WiFi device to establish a connection. Once your device has made an Internet connection with the Orange Livebox, you will not have to do this again for later connections. I have the Web browser plug-in but some sites don’t display properly. Certain Web sites require that you have the Java language installed. Pages that use Java technology will not be able to display Java elements contained in interactive pages. The ARCHOS cannot be turned on. What should I do? 1. You must hold down on the power button for a few seconds to start up the device. 2. Try charging the battery as it may be completed discharged. See Charging the battery in the full manual. Connect the ARCHOS to a computer, which must be ON or have constant power to its USB ports. 3. If the CHG LED indicator will not turn on when plugged into a computer, let the device charge anyway for a few hours (this should be long enough to at least have the device’s 'On' indicator light turn on). Let it continue charging until the CHG light blinks, indicating a full charge. 4. If after a few hours the light does not turn on, reset the ARCHOS: use the end of a paper clip and insert it into the RESET hole underneath the device (see the illustration in our full manual). You will feel a small button depression. Now reconnect it to the computer to charge. If your device still does not operate after charging it and resetting it, you should contact our Technical Support. You are on the recovery mode screen. It means that your hard drive has been corrupted and must be repaired or formatted. With this system recovery mode, you will have to select between “Repair Disk” and “Format Disk”. 1. Start by selecting “Repair Disk” and follow the instructions displayed on the screen. 2. If repairing the disk did not work, restart the device and go into recovery mode again and select "Format Disk". ATTENTION: Note that formatting will erase all data on your ARCHOS device. If your device can be connected to a PC and be recognized, then we recommend you to back up all data stored on your ARCHOS onto your computer. If you still cannot restart your ARCHOS after trying a system recovery, you should contact our Technical Support. When I turn my ARCHOS on, it sometimes freezes and I have to reset it every time. What should I do? Use the 'Repair and Formatting Tools' (Menu > Settings > System). Select "Repair and Formatting Tools" and then "Clear temporary system files and cache". If trying this did not solve the problem or if you cannot access the 'Repair and Formatting Tools', try a system recovery to repair or format your disk. For more info, see System Recovery in our full manual. 1. Shut down the device (if it is not turned off) and turn it on. 2. When the screen turns on, immediately press and hold the TV/LCD button until the Recovery mode starts (white screen). 3. Start by selecting "Repair Disk" and follow the instructions displayed on the screen. 4. If repairing the disk did not work, you can restart the device and go into recovery mode again and select "Format Disk". How can I exit the demo display mode on my ARCHOS 605? 1. You can press the RESET button by inserting the end of a paper clip into the hole underneath the device (to the left of the USB cable connector). Note that it won’t erase any data, it will just restart the device as if it was a computer. 2. Press the power button as usual to turn on the unit. Do not press any buttons, the screen will still display the demo mode for about 20 seconds and then it will go back to normal display mode. I tried resetting my ARCHOS but it still has the same problems (it freezes, some songs and videos files don’t play properly, there are problems with the WiFi connection, etc.). First, make sure you have the most recent update firmware running on your device as this may be the source of your problem. See Updating the firmware in our full manual. If you have the latest firmware installed on your device and still have problems, it could be that the information on the hard drive of your ARCHOS may have been corrupted and should be corrected or formatted by using the system recovery option. For more info, see System Recovery in the full manual. 2. When the screen turns on, immediately press and hold the TV/LCD button button until the Recovery mode starts (white screen). ATTENTION: Note that formatting will erase all data on your ARCHOS device. If your device can be connected to a PC and be recognized, then we recommend you to back up all data stored on your ARCHOS onto your computer. If you still cannot correctly use your ARCHOS after trying a system recovery, you should contact our Technical Support. My ARCHOS screen has frozen and it does not respond. 1. Start by pressing and holding the power button for 15 seconds. This will force a shutdown. Now turn it on normally. 2. If this did not work, use the end of a paper clip and insert it into the RESET hole underneath the device (see the illustration in the full manual). You will feel a small button depression. Now turn on your ARCHOS. I have selected the GPS demo mode and now I cannot exit it anymore to go back to the normal mode. What should I do? 1) Press the RESET button by inserting the end of a paper clip into the hole underneath the device. 2) Press the power button as usual to turn on the unit. Do not press any buttons, the screen will still display the demo mode for about 20 seconds and then it will go back to normal display mode. If resetting the device didn’t work, please contact our technical support team. I have deleted some files on my ARCHOS, but the disk space continues to be shown as occupied. How can I free this disk space definitively? It may be that your device is storing the trashed folders and files on it. This would only happen in the USB Hard Drive mode. 1. Connect your ARCHOS to your computer. 2. Right-click on the trash icon in Windows and select "Properties". You can manage the trash for external devices. Windows may be storing trashed files in a folder on the ARCHOS. 3. You can also free up space by deleting the sample demo video, music, or photo content that comes with the device. After connecting my ARCHOS to my computer, there are new files and folders with gibberish that I never created. It is possible that your device’s hard drive structure (FAT) has been corrupted. This could have been due to a shutdown (due to low battery power for example) while writing to the ARCHOS from your computer. To fix this, use the 'Repair and Formatting Tools' feature of the device (Menu > Settings > System). Select "Repair and Formatting Tools", then choose "Clear temporary system files and cache". My touch screen is not responding as expected. Go to Menu > Settings > Display and select "Touch-Screen Calibration". Follow the instruction on the screen. If this does not work or if you cannot access the touch screen settings, you can force the touchscreen calibration included in the ARCHOS 705 using the 'System Recovery' feature. For more info, see the System Recovery section in our full manual. 3. Select “Force Touchscreen Calibration” and follow the instructions displayed on the screen. If your touch screen still does not respond correctly, this means that it may be damaged. Contact our Technical support on the website Support form. The following message is displayed on my ARCHOS device: “Error code 203”. This can happen if you are connected to a Macintosh computer. 1. Download the following third party software: “Clean UP Smb mess”.You can find and download this application for free on the Internet. 2. Once the software is installed, connect your ARCHOS to your computer. Drag and drop the ARCHOS icon onto this application icon. The application will fix the problem. Once finished, disconnect your ARCHOS device. I cannot format my memory card or copy files on it. - Check to see if your SD card has a small locking switch on it.This protection lock allows cards to be protected from writing or deleting. If your card has a protection lock, make sure that it is switched off. - If your computer has a slot for SD cards (or you have an SD card USB adapter), use your computer to format the card in FAT 32 format. When I insert my SD card, my ARCHOS does not support the format type or freezes. 2. Make sure you have the most recent firmware on your device (see Updating the firmware dans notre manuel complet). 3. Make sure that your memory card is formatted in the Windows FAT* (12, 16, 32) file system. Cards formatted in NTSF or other file systems cannot be read by the ARCHOS. If you can, go to MENU > System and use the “Repair and formatting tools” to reformat the card. ATTENTION: the formatting will erase the contents of your card. Copy them to your computer first if you do not want to lose them. *FAT stands for “File Allocation Table” and is a popular file system used for hard drives and USB keys which is recognized by most computers. I have inserted my memory card into the ARCHOS but its contents do not show up in the Music library. Your music files may not be tagged, which means they do not contain any data about artists, titles, or albums. As a result, the files cannot be classified in the Music library categories. 1. Go to MENU > Settings > System and change the USB mode to "Hard Drive". 2. Select “Update the ARCLibrary” (button that is now enabled). This will recreate your Music library. The ARCHOS supports SD and SD HC cards (and mini/micro SD cards with an adapter), MMC (and RS MMC with adapter) up to 16 GB. The majority of SD card formats available in the market are compatible with ARCHOS products. Although most card manufacturers conform to the SD specification, some may not fully follow such specifications. Unfortunately, due to the large number of cards, a specific compatibility chart is not available. When I insert my memory card, an error message is displayed. This means that the device recognized that a card has been inserted but it cannot read it. This may be due to a problem with the format on the card. - or by reformatting it with your computer if you have an SD card reader. • Or format your card a second time: If your card has already been formatted, the formatting may have not been successful. ATTENTION: the formatting will erase all the data on your SD card.